Mike Moore | The Journal Gazette U.S. Sen. Lindsey Graham, R-S.C., flanked by Sen. Todd Young, R-Ind., left, and GOP Senate candidate Mike Braun, speaks at a news conference Thursday in Fort Wayne. Mike Moore | The Journal Gazette Republican U.S. Sen. Lindsey Graham of South Carolina speaks during a news conference before the Allen County Republican Party Reagan Bean Dinner at the Ramada Plaza Fort Wayne Hotel & Conference Center on Thursday. Indiana U.S. Senate candidate Mike Braun is in the background. 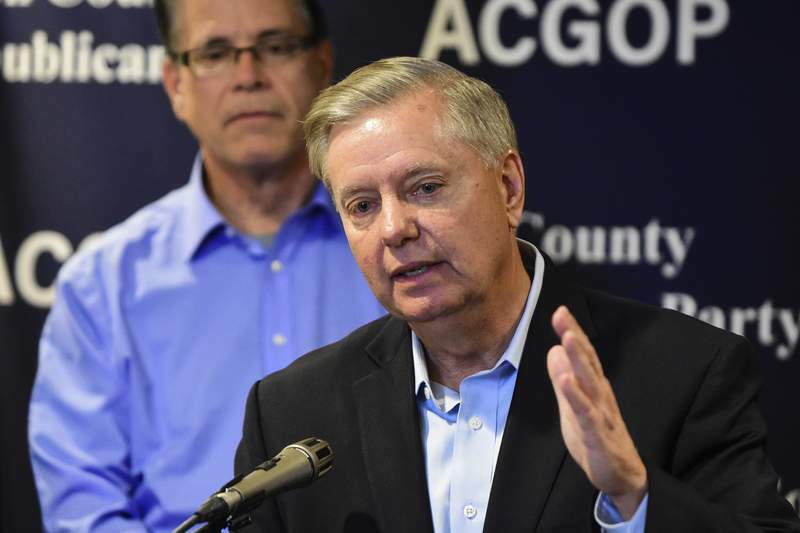 Republican U.S. Sen. Lindsey Graham of South Carolina came to Fort Wayne on Thursday to bash Democrats – Indiana Sen. Joe Donnelly in particular – for opposing President Donald Trump's agenda. “You know why you're here tonight? Elections do matter. You're pissed that your senator, Joe Donnelly, doesn't recognize that Trump won,” Graham told more than 500 people attending the Allen County Republican Party's Reagan Bean Dinner. “When you come to that fork in the road, as all politicians do, between your interests and those that you represent, every time Joe has taken the left fork, not the Indiana lane,” Graham said at the Ramada Fort Wayne Hotel & Conference Center. He blasted Donnelly and Democrats for voting against tax cuts and Supreme Court nominee Brett Kavanaugh and for supporting former President Barack Obama's multination Iran nuclear agreement. Braun, a business owner and former state lawmaker from Jasper, is Donnelly's Republican challenger in Tuesday's midterm election. Their race is among several close contests that will determine which party runs the Senate, now narrowly controlled by the GOP. Graham seemed to galvanize Republican support for Kavanaugh by expressing indignation at Democrats' questions during a Senate Judiciary Committee hearing in September on accusations of sexual assault against Kavanaugh, who later was confirmed by the full Senate. Democrats “have to pay a price for what they've been doing and what they will do,” Graham said Thursday. Graham replied: “There's never been the good old days. You go back and look at campaigns and it's sort of been this way, but it is exceedingly bad here.” He said that “there has to be a pushback” by Republicans on the immigrant caravan in Mexico and Democrats' attempted “destruction” of Kavanaugh. Republicans seek to build a wall along the southern U.S. border to suppress illegal immigration, while Democrats favor bolstering Deferred Action for Childhood Arrivals, which protects from deportation the children of undocumented immigrants. Graham tweeted Tuesday that he will introduce legislation to end birthright citizenship, which is guaranteed by the U.S. Constitution, after Trump said he would try to do so through executive order. 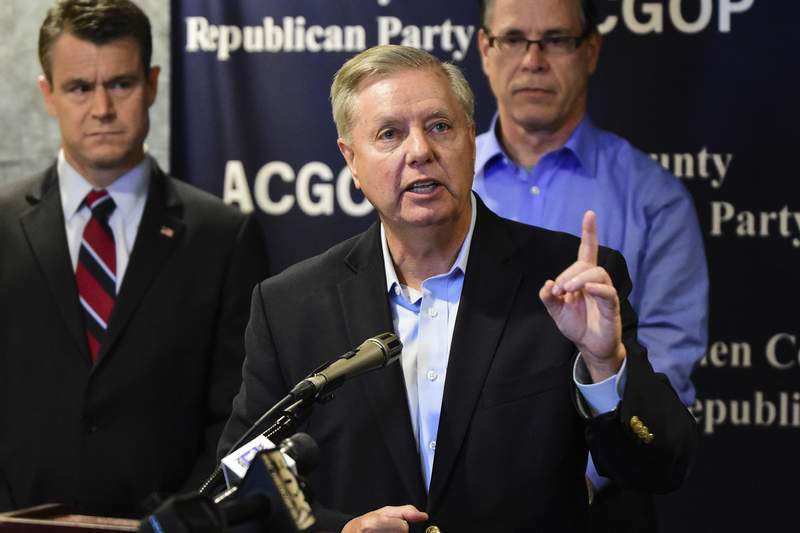 “But if you don't fix the incentives for future illegal immigration, you're going to get more of it,” Graham said Thursday at the news conference. “There's nothing wrong with us trying to change our laws to make sure we don't have 11 million (illegal immigrants) 20 years from now. What's wrong with us is to play like it's not a problem when it is.